Tunable white is a method of producing a varying colour appearance from light sources with two contrasting colour temperatures. Apollo Lighting can supply various products for tunable white solutions, from downlights and recessed modular to surface mounted luminaires. By using a lower colour temperature light source, usually 3000K and a high colour temperature light source, usually 6500K, the two colours can be additively combined to produce any colour temperature between the two values. In a healthcare environment, using a dynamic tunable white lighting installation can help to promote a quicker recovery for patients. 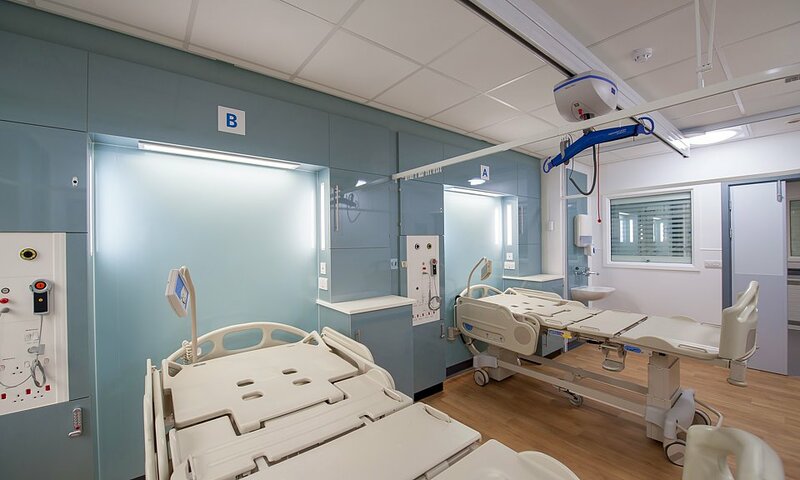 We can offer a full solution for a healthcare environment with our CareLux Duo range of fittings. The system can be designed and controlled to promote a healthy circadian rhythm by using the tunable white function to mimic daylight in terms of both colour temperature and intensity. Tunable white solutions have been used with great success in our installations at Weston Park Hospital, Sheffield. In areas which are used for a variety of different purposes, a tunable white solution can change the ambience of an area to make it feel cool and clinical or to feel warm and inviting. For instance, in a hotel dining area, during the day, the lighting can be cool to match the daylight and during the evening, by making the lighting warmer, the guests feel more relaxed. The warmer colour can enhance the character and atmosphere, creating an attractive and sophisticated space. In shops the use of tunable white can positively affect the appearance of various articles of merchandise. Equally, certain kinds of food look more appetising under varying light conditions. Raw meat looks more appealing under warmer light sources, frozen produce seems more preferable under cool lighting. The appropriate colour temperature is dependent on the overall desired appearance of the items on display. If there are many reds and ambers in the merchandise, a warmer temperature may make the goods look more vibrant however, if there are a lot of blue tones, a cooler colour temperature may be more suitable. In art galleries the colour temperature can affect how the items on display appear. Most art installations are lit with a warm to medium colour temperature (3000K – 4000K). Subject to the display, different qualities will be viewable depending on the position and state of the lighting. If an art gallery has a lot of changing displays, the artist or curator can alter the colour temperature determined by the exhibits. Additive colour mixing is a process by which several colours of light are combined to create a different colour. With tunable white, these colours are typically 3000K and 6500K colour temperature. This will present a choice of colour anywhere between the two. Using the latest LED technology, tunable white is easy to replicate. LEDs can be supplied in various colour temperatures and can be easily controlled. Unlike other technologies, new LED light sources do not require a burn in period and so can be used straight out of the box. Using both of the LED colour temperatures at the same time on full output will be for a short duration only, therefore the heat build-up inside the luminaire is kept to a minimum, extending the life of the LEDs. Apollo Lighting can supply various controls for tunable white, from a simple switch to change between different colour temperatures to larger control systems for automated and dynamic environments.